We are proud to say that over the past few weeks we have been implementing greener practices around our Uniform Advantage offices in South Florida! We rolled out our “Advantage Earth” program which focuses on (note: catchy slogan) “‘Scrub’-bing Away Waste, One Day at a Time.” With Advantage Earth, we hope to not only make a difference in our own offices but also to encourage others to implement similar practices. We strategically placed two large commingled recycling bins right next to our trash bins in our break room, making the option to recycle more convenient. First, the medium-sized trash bins at each desk were converted into commingled recycling bins. 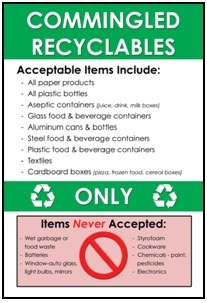 “Commingled Recyclables” stickers were made for each bin that outline what can and cannot be recycled. Now, you may be thinking, “What about those items considered trash?” Well, that’s where “Mini-Bins” come into play. We ordered Mini-Bins from a Midpoint International Inc for each desk. These Mini-Bins are 1.5L, which initially may not seem like enough, but when you think about how much can actually be recycled, it’s the perfect size! Finally, we stopped ordering the Styrofoam cups that were being used for coffee. 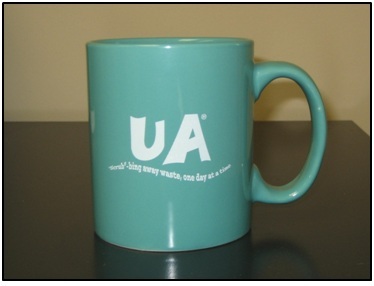 In place of these cups, everyone at the offices received a UA mug stamped with our “’Scrub’-bing Away Waste, One Day at a Time” slogan. Phase 2 (part 2): Pizza party! Because everyone was so compliant and excited about the Advantage Earth program, Uniform Advantage provided a Pizza Party for everyone on Friday the 13th… I guess it’s not such an un-lucky day after all J.
We’d love to give anyone and everyone more details on how we implemented Advantage Earth, so please leave us your feedback, questions and comments. I hate the NEW side slits! I liked the scrubs the way they were and that was the reason I USE to love the UA bast buy scrubs! But now you just lost my business!! To view all of our men’s scrubs please visit our men’s department.